Measuring the elevation of parts of House 17. 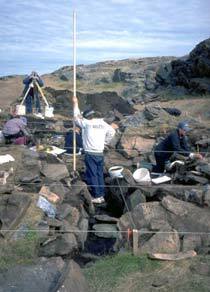 The following pages contain photos from an archaeological excavation carried out in the summers of 1998 and 1999 at Tungatsivvik, a large Thule culture site on Baffin Island at the head of Frobisher Bay, just outside Iqaluit. The long-term research goal of excavating the Tungatsivvik site was to learn about the economic differences between small and large Thule culture winter camps in the Eastern Arctic. Previous archaeological research at Thule winter sites had focused on large sites—sites containing between 10 and 30 houses. Very few small sites had been investigated. Therefore, in 1996 and 1997 we carried out excavations at the small Davidson Point site which had just three winter houses. According to our present understanding of Thule settlement and subsistence, winter sites this small should be rare but in fact they represent over one-third of all known sites. Why and how did the Thule people winter in such small groups when larger groups make more sense ecologically and socially? In order to provide comparative data, in 1998 and 1999 we carried out excavations at the nearby but much larger Tungatsivvik site. In this part of the Arctic people have tended to camp repeatedly in the same locations, so most sites are "multi-component" (i.e., were used successively by people of different cultures). Before the Thule lived there, the Tungatsivvik site had been occupied by people of the ASTt (Pre-Dorset) and Dorset cultures. While we were at the site we also excavated a small Pre-Dorset component which we called Area Q.